A design challenge to propose an experience for eligible voters to vote in elections online. As I have personally never participated in an election, doing the necessary research was a good learning experience for me. In addition to using the web, I spoke with a few friends who have previous voted to listen to their pain points. I captured notes as a map of related concepts, then used them to assemble a user journey map. Due to time constraint, I created a proto-persona who is a potential 1st time voter, so that I can draw on personal experience. However, being an app targeted at first time voters, I also wanted to make sure my app guides the user through the entire process. I then looked at some existing solutions to see what they do well and what is lacking. As stated earlier, my target audience is a first time voter, therefore it’s important for the app to guide the user through the voting process, from registration, all the way to casting the ballot and checking the results. I envision the default experience of the app being a dashboard that displays information relevant to where the user is in the voting journey. There’s a dedicated area on the dashboard that specifically guides the user through the voting journey. For this web app to be successful, it needs to be interoperable with the other components in the bigger voting ecosystem. For example, if the user registered to vote via mail, they should still be able to enter certain information into the app so that they can continue their journey there. 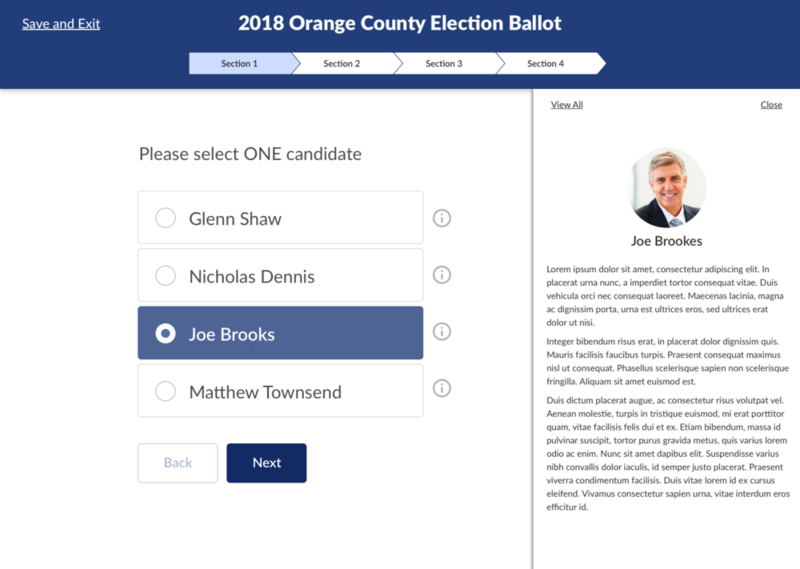 Another consideration may be how a user can start filling out their ballot in the app, but complete and cast the ballot in person at a polling station.